When turning on the unit for the first time, you are greeted with the D-Link logo (actually, every time you turn the unit on). There is really no initial setup for the photo frame. An initial screen that shows up when the unit is turned on every time is the default. From this home screen you can do the various functions of the unit. The unit actually has some preloaded images on its 1GB of internal memory (sort of how normal picture frames come with a sample picture). The internal memory of the unit is called the "Favorites." When viewing the pictures, they are nice and crisp and have many effects for transitions. The one being shown is the fade in/out. The controls at the bottom of the frame are only for moving back and forth through the pictures or other modes. There are no menu controls on the device which is a bit of a design problem. If you lose the remote, the unit's functionality will be sorely limited. Thankfully, the unit defaults to showing pictures if no mode is selected from the home screen. When setting up the unit for wireless connectivity, the screen shows all available networks in range and in my area there are a number of them. Getting on the proper network is simple as there is a keyboard that pops up on the screen to type in the available keys and such. You can also join a hidden network. Aside from this wireless screen, you can also set a static IP address and other options as well as use a wired connection which works fine as well. When connected to the internet, the first thing the frame did was located a firmware update. Drawn to always keeping things updated, the unit was allowed to download and install the recommended firmware update. It seems that D-Link thought of what happens when power is turned off while an update is happening. Thankfully this will not brick the device. DON'T PANIC as the device elegantly says. The Home Network portion locates any Zeroconf (UPnP) servers on the network and MythTV happens to be one of those sources. The unit will only show pictures and not videos from the Zeroconf source. It is nice if you have a server full of pictures since you don't need to transfer them to the frame. Once the unit is setup for internet use and an account is created at FrameChannel, the unit becomes a very handy information source. You can do all sort of things with the unit setup with FrameChannel. The only thing is that if the unit cannot connect to that website then the internet portion is useless. Thankfully, the DSM-210 is still a regular picture frame so this functionality is not lost. That being said, it is very handy to have a device like this in the kitchen showing off the latest news and weather reports. There are many other different pieces of information that you can add to the frame and it works simply by logging into your account and added the information. The frame does the rest itself. Back to the photo frame part of the unit. When inserting a card or USB flash drive, a new menu option appears in the Frame Memory section. Selecting the new location will show the pictures contained in the section. Moving pictures to the internal flash memory is a pain in that you need to select each picture individually and set it as a favorite. This process is tedious and most people will probably just leave a SD card in and forget it. Other than that, the unit is very well designed and laid out. The D-Link DSM-210 is an excellent addition to D-Link's home media line-up. It can easily grab photographic content from any internal network as well as grab information off of the internet to expand its use in the digital home. »Checking the latest prices, the DSM-210 comes in at around $210 from various retailers. This is an expensive product if you are only using it as a photo frame. The price point becomes more reasonable when using the features of the unit to the fullest. The wireless connection along with the ability to grab information and content off of the internet makes the DSM-210 an excellent addition to any kitchen. Checking the latest news and weather reports is a breeze now in the house thanks to this handy device. The D-Link DSM-210 is a very innovative product and we're happy to give it an award for forward thinking. 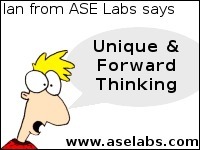 ASE Labs would like to thank D-Link for making this review possible.